The drop floor system allows greater productivity by allowing the operator to unplug the baler without leaving the operator's station. Another benefit of the drop floor is the bale doesn't have to be aborted to release the plug. 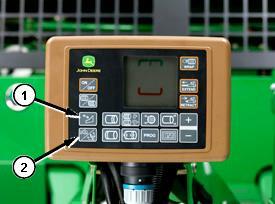 This saves time and effort, and it allows the operator to put up higher-quality feed. 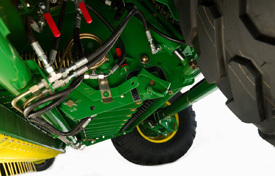 The drop floor system replaces the rotor reverser system, which is a feature on the 582 Silage Special Round Baler. To drop the floor, press the drop floor icon on the monitor and push the selective-control valve (SCV) lever forward. 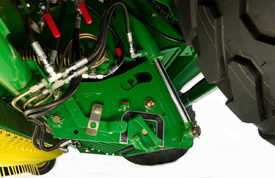 This releases the plug and allows the operator to continue baling without encountering much downtime. John Deere's 7-in.-wide diamond-tread design ensures fast bale starts and grips the bale to prevent slippage and reduce chaffing. The treads are self-cleaning to reduce carryover. Shield removed in photo for illustration purposes only. Belts enclose 91 percent of the bale width to reduce the loss of fine material and retain hay quality. Staggered belt roll design enables any loose hay under or behind the belts to be returned to the pickup and into the baler. The belts are constructed of three-ply combination nylon-polyester. Polyester is used for increased strength and reduced belt stretch. The belts have the strength to handle heavy shock loads and help to maintain a consistent belt length throughout their lifetime. The MaxiCut™ pre-cutter features 14 stationary redesigned knives (arrows). These knives have a different geometry, which allows better crop engagement and requires less horsepower. The knife spacing is 2.8 in. This option allows producers to select utilizing 0, 7, or 14 knives at any one time. Producers using 7 knives can run twice as long using the knife selector before needing to sharpen knives. The COVER-EDGE net wrap is base equipment on the 854 Silage Special. High-quality hay has many advantages, such as increased marketability and quality feed for livestock. The COVER-EDGE net wrap increases the profitability of any operation. The BaleTrak™ Plus monitor-controller allows a bale to be wrapped at any time by pushing the wrap key. This is convenient when finishing up a field. 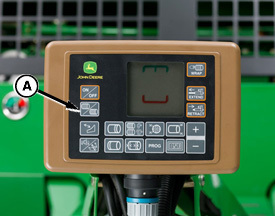 The operator can select twine or net wrap with BaleTrak Plus by pushing button A conveniently from the tractor seat. The net-wrap attachment is located in the back of the baler, making it easy to load the net-wrap roll. NOTE: Edge-to-Edge net wrap material will work in the COVER-EDGE net wrap attachment. Refer to the round baler operator's manual for proper adjustment. Plugs are available through AMBRACO to center the roll in the attachment. 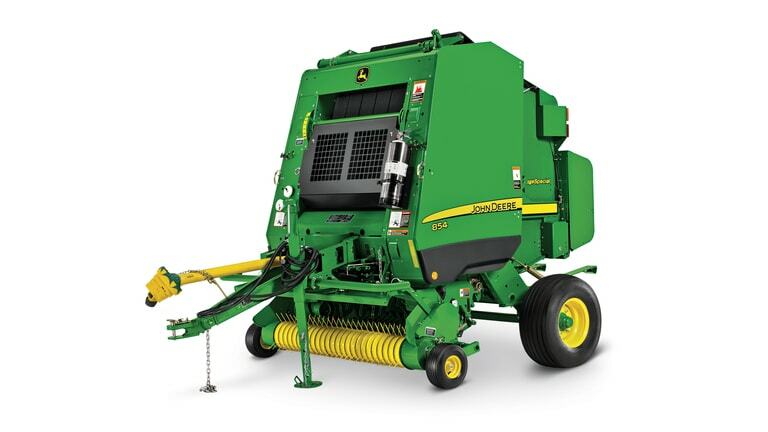 The 854 Silage Special Round Baler features the BaleTrak Plus monitor-controller. 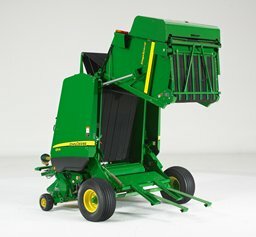 This feature allows the operator to both monitor and control important baler functions for productivity and convenience. A 24-bar graph makes it even easier to make a well-shaped bale that will stand tall and remain firm over time. The 24 bars provide smaller increments of change to give the operator a more precise indication of bale shape. Preset factory settings allow operators to turn on one switch and go bale; it's just that easy.